WILKES-BARRE, Pa. – Junior Blake Bowman (Valley View, Pa./Tri-Valley) rushed for three touchdowns and caught one more to lead the Lycoming College football team, but a last-minute touchdown by King’s College helped it take a 30-26 decision in Middle Atlantic Conference action at McCarthy Stadium on Saturday, Oct. 17. Bowman carried the ball just 22 times for his 142 yards, scoring on two carries of one yard and one of two yards. He also caught one score from four yards out, as he became the fifth player in school history to score four times in a game and the first since 2002. The Warriors (1-5 overall, 1-4 MAC) came back from a 21-13 halftime deficit, forcing a 3-and-out to start the second half before driving 72 yards in seven plays, with Bowman diving in from a yard out. After another quick defensive stand, the Warriors went driving again, taking the lead on the second play of the fourth quarter with a two-yard score from Bowman, which made it 26-21. King’s (2-4 overall, 2-3 MAC) answered with a 67-yard, 11-play drive that was capped on a 29-yard field goal from Mikhail Kniaziewicz. After a three-and-out by the Warriors, King’s took the lead on a 72-yard, 14-play, five-minute drive, with Gabe Brown finding the left pylon with 52 seconds left on a third-and-goal play. After the kickoff was returned to the Lycoming 30-yard line, the Warriors had a chance for a big play when junior quarterback Chase Whiteman (Gettysburg, Pa./Gettysburg) found a receiver over the middle near midfield, but Anthony Martuccio came in and stripped the ball and Tyler Cruz fell on it to seal the win for the Monarchs. King’s got on the board with their first drive of the game, driving 75 yards in six plays before Tom Hehre rushed 11 yards into the left corner of the end zone. The Warriors turned to its own ground game on the next drive to get on the board, with junior Blake Bowman (Valley View, Pa./Tri-Valley) getting seven carries during a nine-play, 72-yard drive before Bowman crashed in from one-yard out to make it 7-6. The Monarchs took a 14-6 lead with an 11-play 65 yard drive to respond, as Hehre found Marquis Miller for a 12-yard score. 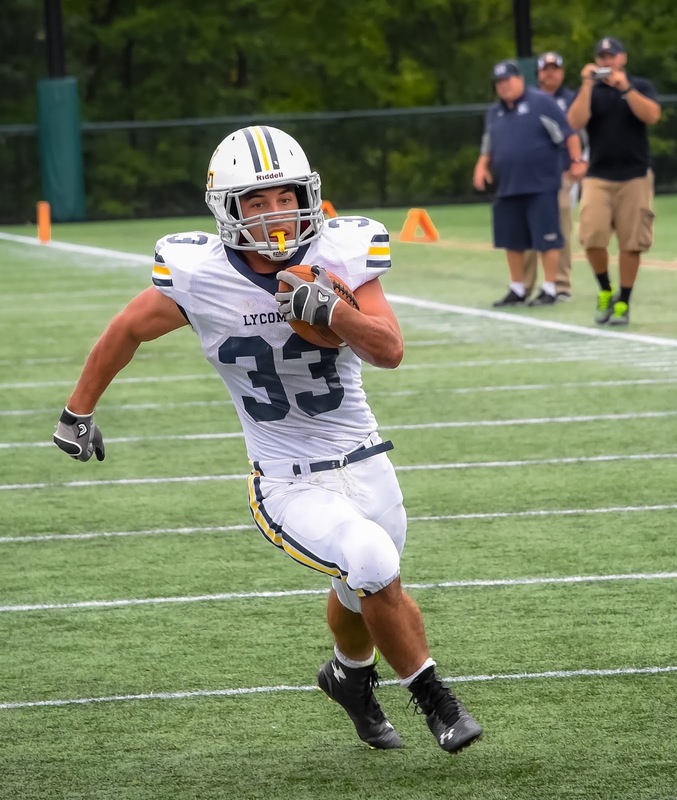 Lycoming came right back, though, scoring on an eight-play, 65-yard drive, with Bowman crashing in from four yards out on a backdoor screen pass from Whiteman for his second score of the game. Before halftime, a Lycoming drive stalled at the King’s 23-yard line and the Monarchs took the ball 77 yards in nine plays, all pass attempts, with Hehre finding Mike Palmer from 15 yards out for a score to make it 21-13 at the break. 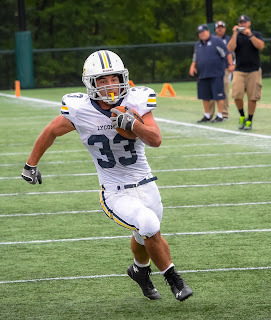 Senior Ryan Umpleby (Forest Hill, Md./Fallston) finished with 191 all-purpose yards, making six catches for 93 yards and five kick returns for 98 yards. Whiteman went 12-of-18 for 168 yards and a touchdown. He was also intercepted once and ran for 22 yards on seven attempts. Senior Cole Welham (Lewistown, Pa./Lewistown Area) posted eight tackles, two for loss and senior Phil Schron III (Albrightsville, Pa./Marian Catholic posted eight stops and 2.5 tackles for loss to lead the Warrior defense. Hehre finished 24-of-38 for 231 yards and two scores for King’s, with Mike Palmer his top target, as Palmer finished with seven catches for 89 yards and a score. Marquis Miller made six catches for 50 yards and a score and Gabe Brown led the rushing attack with 17 carries, 71 yards and the game-winning touchdowns. Michael Martina and Bobby Russell led the Monarchs with seven tackles a piece and Jake Manetti notched four stops and an interception. The Warriors get back in action on Saturday, Oct. 24, when they face FDU-Florham as part of the college’s Homecoming festivities. Kickoff is set for 1:30 p.m.